We are remarkable enterprise, instrument in offering superior quality Fancy Candle Lantern. Under the guidance of our experts, our company offers an ample range of Garden Candle Lanterns to our respected customers. These are fabricated using various types of metals. We offer these products in different sizes and fascinating colors. Our experts conduct various quality tests so they comply with international standards. We are a leading manufacturer & supplier of lanterns in iron, stainless steel & brass. The same lantern is available in iron with powder-coated finish and stainless steel with polish finish. We commence our business as the leading organization of the best quality Decorative Lantern. We bring forth our vast industrial experience and expertise in this business, instrumental in providing Designer Moroccan Lanetrn. 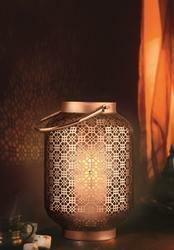 This Crystal Lantern will add a dash of grace to any corner of the room with its unique design. It is in beautiful shape and included with a suspension hook which will help you to handle it easily.